Coverage: Live commentary on BBC Radio Wales Sport from 19:00 BST, score updates on the BBC Sport app, the BBC Sport website and live text on the BBC website. 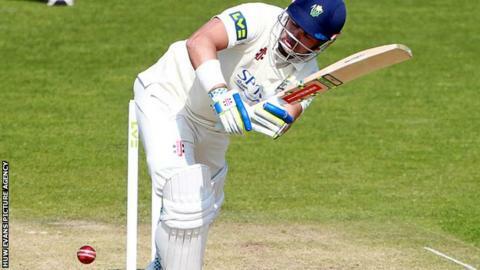 Glamorgan captain Jacques Rudolph says the county will take confidence from last season's victory away to Surrey as they begin their T20 Blast campaign at the Oval on Friday. The Welsh county reached the quarter-finals last year and have not qualified for Finals Day since 2004. "We've got a good reference from last year when we beat them (Surrey)," said Rudolph. "So we'll go into it with a lot of confidence." He added: "hopefully we can get off to a good start." Glamorgan will be without new overseas player, South African international Wayne Parnell, who is out because of a groin injury. Surrey will not have Kevin Pietersen available, with the former England batsman being scheduled to play in the Indian Premier League before picking up an injury against Leicestershire, where he hit his career best score of 355 not out. But they will have star Sri Lankan batsman Kumar Sangakkara and Pakistan pace-man Wahab Riaz in their ranks. Glamorgan's first home match in the T20 Blast competition is against Essex on Friday 22 May immediately following a championship match against the same opposition at the Swalec Stadium. Glamorgan team to face Surrey: Will Bragg, Ruaidhri Smith, Jacques Rudolph, Mark Wallace, Colin Ingram, Ben Wright, Chris Cooke, Craig Meschede, David Lloyd, Andrew Salter, Graham Wagg, Dean Cosker, Michael Hogan. Surrey squad: Gareth Batty, Zafar Ansari, James Burke, Rory Burns, Tom Curran, Steven Davies, Matthew Dunn, Ben Foakes, Aneesh Kapil, Wahab Riaz, Jason Roy, Kumar Sangakkara, Vikram Solanki, Gary Wilson.